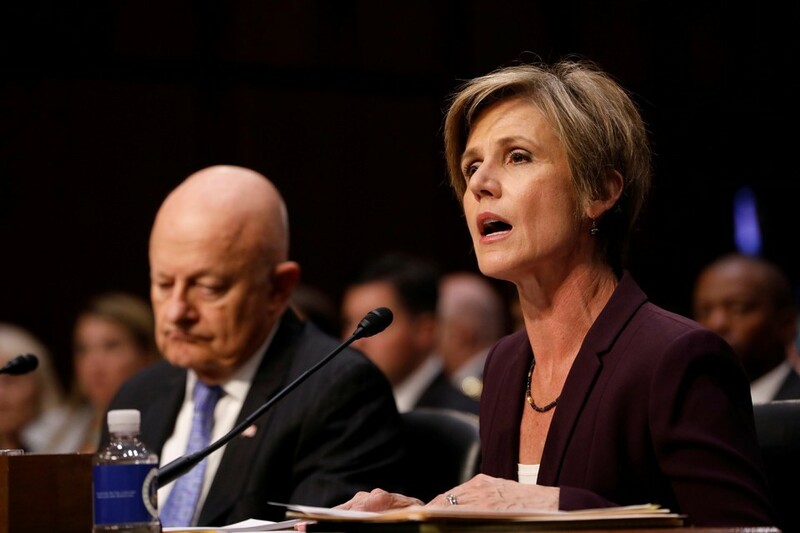 As I watched a live stream of former Acting Attorney General Sally Yates testifying before a Congressional panel yesterday about the Trump administration’s possible ties to Russia, and the unconstitutionality of President Donald Trump’s proposed travel (read-Muslim) ban, it was clear that Yates was easily the most intelligent and best prepared person in the room. For analogy purposes for all who did not watch it live, Yates was the Harlem Globetrotters and her GOP inquisitors were the Washington Generals–underwhelming and overmatched from the opening tip-off. Yates’s inquisitors included Senator Ted Cruz, a man who is often lauded as a brilliant conservative legal scholar, but one whose smarmy “gotcha” question/statement about the president’s authority to issue the Muslim travel ban was completely eviscerated by Yates as she calmly and carefully outlined why the Constitution forbids such an act. Cruz sounded like a first year law student who had not read the assignment, but still boldly rambled on and pressed points back at the law professor who is alternately amused and befuddled by such wanton ignorance on display. Still, as I watched the recap of the day’s events on CNN, there was Wolf Blitzer on my TV saying that Cruz had “met his match” with Yates. No, Cruz and his GOP cohorts, all white males, proved no match at all against Yates. You see, for many brilliant women like Yates, and other brilliant thinkers and doers who are not white Christian males, there are age old assumptions that minority or female brilliance is either an anomaly or something to be devalued. I have always found the admonition from my parents and elders that as a black boy/man that I have to be “twice as good as a white boy/man” rather flawed in that it assumed that those white guys that I competed against in academic settings were “good.” Some were, of course, but many were not. Still, I always got “it,” with it being the fact that the system was created by and remains in some respects rigged against blacks, non-white Hispanics, Muslims, LGBTQ and women. To be clear, as a historian and a lawyer, I can rattle off the names of many brilliant white men who have contributed greatly to world and American history. I can also rattle off the names of many mediocre white men who rose to prominence not because of deeds accomplished or strength of mind, but because of strength in numbers and a “Good Ol’ Boy” network that sometimes promotes mediocre white men and propels them to positions of power in government, industry and academia that many are otherwise ill qualified to hold. Indeed, for all of the attacks on Affirmative Action programs that over the past half century have provided some semblance of chipping away at white male hegemony in government, industry and academia, the truth of the matter is that the original and most pronounced form of Affirmative Action is the “Good Ol’ Boy” network. This network explains how men like George W. Bush and Donald Trump gained admission to and graduated from Ivy League schools like Yale and Harvard (Bush), and the University of Pennsylvania (Trump), when both men speak and write with the clarity of a fifth grader in regular if not remedial classes. As such, to hear people exclaim “Ted Cruz attended Princeton and Harvard Law” as if by invoking those names that such inures some form of superiority that automatically rendered him a match for Yates is laughable; Cruz spent most of his legal career in political patronage jobs but having served as Solicitor General for several years, Cruz should know one of the basic canons of the profession, which is that a lawyer is not to undertake motions or positions that he or she has a good faith belief are unlawful. To that end, that Cruz so willingly defends Trump, a man who no one will confuse as the next William Howard Taft (former president who later served as Chief Justice of the Supreme Court), or Justices Oliver Wendell Holmes, Jr or Louis Brandeis after he hastily crafted a travel ban that broadly discriminated on the basis of religion, one which the Framers of the Constitution expressly forbade per the First Amendment’s Establishment Clause, is disturbing. But even more disturbing is the fact that despite all of the gains of minority lawyers (including women) as far as entering into arenas long shut off to us by both brilliant and mediocre white men, we still find ourselves battling for “credibility,” as one CNN article this morning suggested that Yates won yesterday, as if she was suspect before. No, the greater question should be why some of the same men (such as Trump) who routinely display limited vocabularies, poor grammar, and a complete lack of understanding of American and World History and current events, somehow come to the table with credibility, even after their lack of intellectual acuity and penchant for dialectical mendacity are routinely on display? Nail it keeping up with Hobbs lessons.